We hope everyone had a great Memorial Day weekend! It’s always fun to have an extra day off from school. This year, we are really lucky because we are still in the midst of our 4-day weekend. Our exam schedule was different this year, and we lucked out with an extra day off! Well, Celine actually had a 5-day weekend. So, while I was taking my (difficult) English exam on Friday morning, Celine made these scones. But even though I didn’t help make them, I still got to enjoy them, and let me tell you, they are delicious. 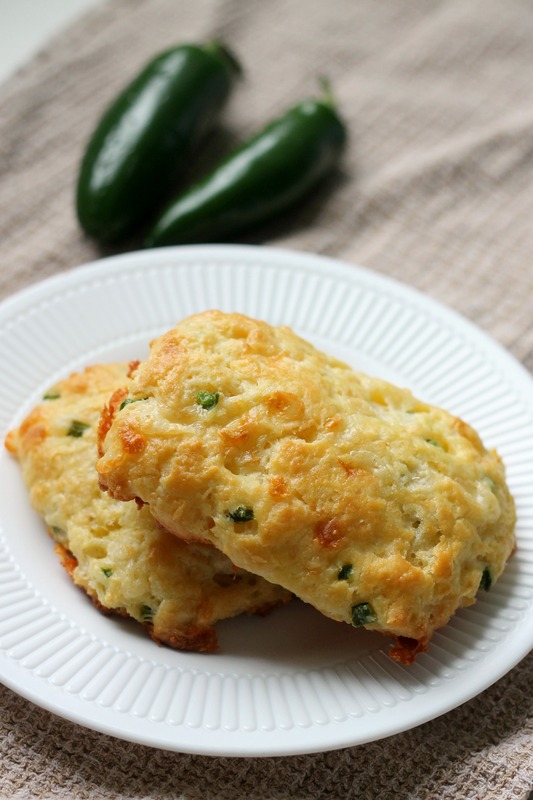 A tender, buttery scone filled with chunks of cheddar and chopped jalapenos. Don’t worry, they are not too spicy. They have a slight kick, but nothing too bad for breakfast! I will let you in on a secret: I actually hate cheese (except mozzarella and parmesan). I don’t mind cheddar or American used in things, but other than that- no way! Brie, blue, and, worst of all, goat cheese are all on my hate list. I blame it on a gross cheese sandwich I ate in kindergarten. I don’t even do macaroni and cheese. 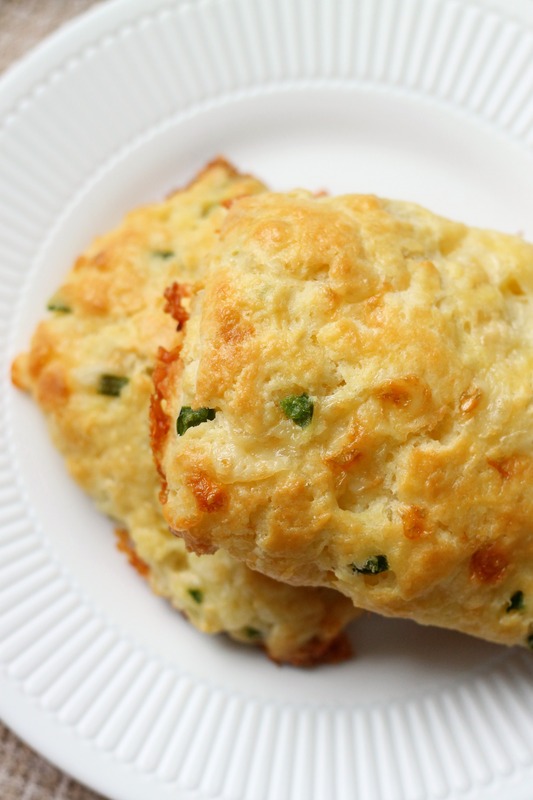 Anyway, even though I hate cheese, I loved these scones. Cheese lovers and haters alike will definitely enjoy these! Preheat oven to 400°F. Melt 1/2 tablespoon of the butter in a small skillet and cook the jalapenos in it for about two minutes, or until soft. Let this mixture cool. Place it in a small bowl with the cheddar and coat with one tablespoon of the flour. Set aside. In a medium bowl, mix together the remaining flour with the baking powder and the salt. Next, cut in the remaining butter with a pastry blender or a fork (or your fingers!) until the butter lumps are pea-sized. In a small bowl, lightly mix two of the eggs and the cream. Add it to the flour-butter mixture and stir until it begins to come together. Add the cheddar-jalapeno mixture and mix until combined. Turn the dough out onto a well-floured surface and knead very gently for about a minute (not too long or you will end up with tough scones!). Pat the dough out to a 3/4- to 1-inch thickness and cut into the shape of you choice- we just cut rectangles. Beat the remaining egg with a teaspoon of water. Brush the scones with this egg wash and place them on a parchment-lined baking sheet. Bake until golden brown, about 25 minutes. Enjoy!